SMAI Premium range of Amateur Boxing trunks are reversible and made from light weight and breathable Silk like mesh fabric that will mould to your body and is specifically designed for the Top level Athlete with unmatched comfort and fit. 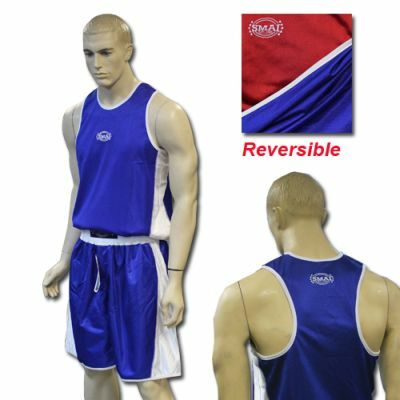 The Trunks are reversible in colour with an easily reversible Blue or Red side to suit your corner on the day without the need for purchasing additional uniforms with SMAIâ€™s own 2 In 1 feature. If you want the best Amateur boxing apparel available internationally SMAI should be your only choice! Support Australiaâ€™s own Fight wear Apparel company SMAI and Sponsor of Boxing Australia developing the future of boxing in Australia.